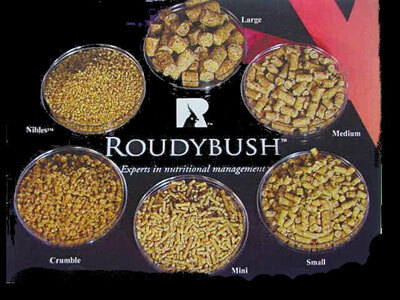 Roudybush Low Fat Bird Food 10 Lbs. For parrots and other pet birds that need to be on a daily low fat diet. Feed to adult birds that are not laying eggs or feeding chicks and that have a tendency to be overweight. Mix 1/3 Breeder with 2/3 Low-Fat Maintenance for chronic egg-layers and birds with a tendency to develop hypocalcemia (such as African Greys). Do not give other vitamin or mineral supplements. Fresh fruit and vegetable treats may be given as a minor part of the diet. Premium bird food for your valuable pet bird! Your small to large-sized birds will enjoy great taste and nutrition from this low-fat maintenance diet. 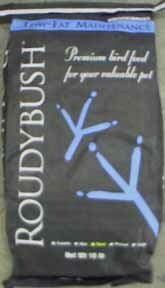 Roudybush Low Fat Daily Maintenance Diets are specially steam pelleted to retain beneficial nutrients while eliminating harmful bacteria. Contains 12% protein, 3% fat. Please specify Lowfat Crumbles (for small birds) or Lowfat Medium (for large and medium-sized birds). Now comes in a stand up bag with zip lock seal. Medium: Large Macaw-Large Cockatoo-Dwarf Macaw-Small Cockatoo.